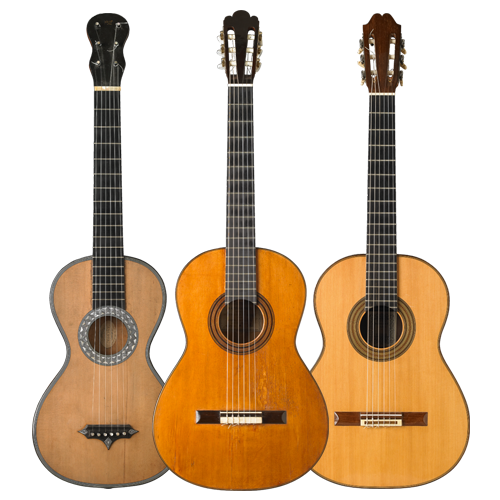 Welcome to the Harris Guitar Foundation and its historical collection of vintage classical and flamenco guitars on display at the San Francisco Conservatory of Music. On stage at SFCM: L. John Harris, Pepe Romero, Richard Bruné and David Tanenbaum with guitars from The Harris Guitar Collection at Guitarrada V, 2009. HGF is a 501 (c) (3) charitable foundation with a mission to promote the classical guitar in the Bay Area and beyond. This mission is expressed, most concretely, through the foundation’s support for the guitar program at the San Francisco Conservatory of Music. By making the Harris Guitar Collection available to students, faculty and guests for research, performance and recording, the foundation seeks to make the living legacy of the “Spanish” guitar and its special sound available to students launching careers devoted to the guitar and to the professionals who teach them. The HGF is also a proud supporter of San Francisco’s OMNI Foundation for the Performing Arts, an award-winning presenter of classical guitar performances. OMNI brings to San Francisco some of the finest classical guitarists in the world. Collaborations between HGF, OMNI and SFCM are planned. The Harris Guitar Collection features over three dozen instruments made by the great classical and flamenco guitar makers of the 19th and 20th centuries. In collaboration with the San Francisco Conservatory of Music, a rotating selection of guitars from the Collection are now on display in a glass display cabinet in the John and Lisa Miller Alcove off the Conservatory’s dramatic Phyllis Wattis Atrium. View the Collection page to see photographs of the entire Harris Guitar Collection and learn about their constructive, acoustical, historical and decorative details. In addition to the guitars from the Collection on display at the SFCM, there will be one guitar showcased each semester crafted by a contemporary maker, influenced by the historic luthiers represented in the Collection. The Featured Luthier will meet with students to discuss issues related to the making of guitars to satisfy the needs of players today. View the Featured Luthier page to see the current guitar on display and a description. The HGF sponsors a variety of concerts, events and special programs. Our Guitarrada events are bi-annual. You can check the calendar to see whats coming up. If you would like to be on our mailing list, please send your contact email to harrisguitar@gmail.com. We will keep you informed on what’s coming up.